Categories in eCom serve as your site’s navigation. Unlike Retail, products in eCom can appear within more than one category. You can add extra information to categories in eCom such as description, content and featured image. For more information, refer to the eCom help topic Creating categories. Categories created in Retail are pushed to eCom but the reverse is not possible: categories created in eCom are not synced back to Retail. 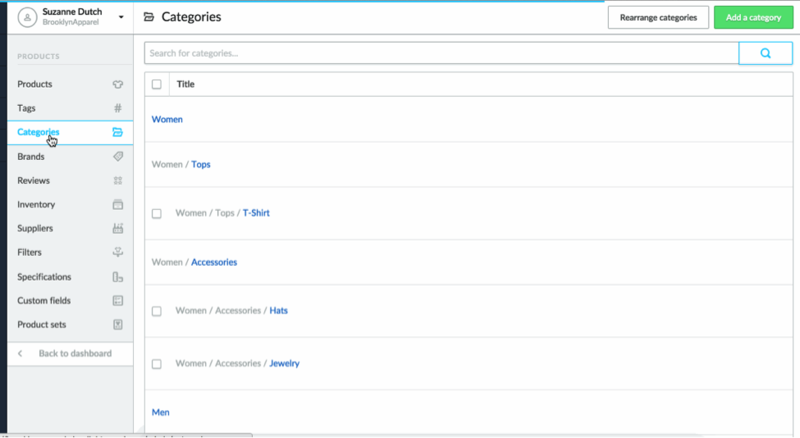 Categories in Retail are pushed to eCom for the first time when you launch your eCom store. During this process, all top level categories in Retail are pushed to eCom as top level categories. This also applies going forward when new top level categories are created in Retail. The first 6 levels of categories and subcategories in Retail are also pushed to eCom with the correct category tree structure. The 7th and subsequent subcategories in Retail are still pushed to eCom, but outside of their category tree structure. This 7th category becomes a top level category in eCom and creates its own category tree with the remaining subcategories. NOTE: Depending on when you initially launched your eCom store, an In Store top level category may exist in your eCom store. If so, all top level categories and subcategories in Retail are pushed to eCom under this In Store parent category. For top level categories in Retail to push to eCom as top level categories and have their subcategories follow under them, you need to move the subcategories out of the In Store parent category in eCom. Afterwards, delete the In Store category in eCom as well. Refer to the eCom help topic Creating categories for more information on rearranging and deleting categories. optimize your eCom store visibility in web search engines. facilitate the organization of your products upon launching your eCom store. increase consistency between your Retail account and eCom store. Go to Settings > Workflow. Click the Maintain parent/child relationship when assigning categories to a product toggle. Retail: When an item is assigned to a category in Retail, your product in eCom is assigned to all levels of the category tree. For example, if your item in Retail is assigned to Boots from the category tree Women/Shoes/Boots, your product in eCom is assigned to Women, Shoes, and Boots. This category tree synchronization is triggered when you initially launch your eCom store or when you create or update categories or subcategories in your Retail account. eCom: When a subcategory is assigned to a product in eCom, all its parent categories are assigned as well. This category tree preservation also applies when you rearrange subcategories into a different parent category. The associated products are assigned to all levels of the new category tree. NOTE: If you reassign or rearrange your categories in your eCom store, this will break the category tree synchronization between your Retail account and your eCom store. For this reason and depending on your business needs, reassigning or rearranging categories from you Retail account may be the preferred workflow. From the back office, navigate to Products. Go to Categories in the Products menu. Click on the name or title of a category. Scroll down to the Visibility section. Check the box for Include in catalog. Repeat steps 1 - 6 for each category and subcategory that you want to make visible. NOTE: eCom allows you to display up to three levels of categories and subcategories, whereas Retail allows you to have up to ten. If you use more than three levels in Retail, you will need to rearrange your categories in eCom to make your items visible. Rearranging and renaming categories in eCom will not effect categories in Retail. However, moving a subcategory from one category to another in Retail only affects eCom if the category has not been moved in eCom. Also, changes to a category name in Retail are only pushed if the corresponding category has not been renamed in eCom. Product A is in Category 3. Product A is now in Category 1. Subcategories 4-6 are reassigned to Category 1. For more information on how to merge categories in your Retail account, please see our Creating categories article. NOTE: If you reassign or rearrange your categories in your eCom store, this will break the category tree synchronization between your Retail account and your eCom store. This includes Retail category merges. For this reason and depending on your business needs, reassigning or rearranging categories from you Retail account may be the preferred workflow. When a category is merged into another in Retail, the category that is merged in is deleted in eCom along with its metadata (such as category image, SEO tags, etc.). Categories can be deleted in Retail and in eCom. When a category is deleted or merged in Retail, it is automatically deleted in eCom. If you delete a category in eCom, all products are removed from the category in eCom and your change is not pushed to Retail. If this category, or any related category or product, is saved in Retail, then the category is recreated in eCom. Products are only re-added to this category in eCom when they are next saved in Retail. For these reasons, deleting categories in eCom is not recommended. When a category is deleted or merged in Retail, the category is deleted in eCom along with its metadata (such as category image, SEO tags, etc. ).